Am I nuts to put 100% of my retirement savings in stocks? I don't think you're nuts for taking Social Security and your annuity into account when deciding how to invest the money in your retirement accounts. But by investing your nest egg entirely in stocks I'm not sure you're being entirely reasonable either. So before you go through with your plan, I'd suggest you at least consider a less extreme stance. In theory, what you propose makes a certain amount of sense. After all, Social Security and your immediate annuity are kind of like a big bond that makes steady payments. And even though your Social Security and immediate annuity don't have a market value per se, you can still estimate the value of those future payments. For example, let's say a married couple who earns a combined $90,000 or so a year retires and begins collecting Social Security at 66. According to Financial Engines' Social Security Retirement Calculator, the present value of their payments would be roughly $1 million based on their projected life expectancies. If that same couple owned an immediate annuity that paid out $900 a month as long as either of them was alive, the value of that annuity would be roughly $200,000, based on what this annuity payment calculator estimates a 66-year-old couple (man and woman) would have to pay to buy an immediate annuity generating that level of payments. So you could think of this couple's Social Security benefit and immediate annuity payments as sort of like having $1.2 million invested in bonds. If the couple also had, say, $300,000 in retirement savings invested entirely in a diversified portfolio of stock mutual funds, then you could say that they had the equivalent of $1.5 million in assets overall with 80%, or $1.2 million, invested in bond-like investments (the estimated value of their Social Security and immediate annuity) and 20%, or $300,000, in stocks. Viewed that way, one could conclude that this couple is investing very conservatively. After all, many pros typically recommend that retirees of that age invest anywhere from 40% to 60% of their investment portfolios in stocks. So an overall allocation of just 20% in stocks would seem pretty tame. And if instead of going 100% in stocks, the couple were to invest, say, 50% of their $300,000 in stocks and 50% in bonds, that would result in an overall allocation of just 10% to stocks and 90% in bonds, an allocation that many people might see as way too tame. Then again, your Social Security benefit and annuity payments aren't actually bonds. And if you think of your portfolio just in terms of the money you actually have access to, it's invested 100% in stocks, an allocation many retirees, if not most, would consider anything but tame. Related: Are you behind on retirement saving? There's also a big practical difference between actual bonds and your Social Security and immediate annuity. If you need to come up with a big chunk of dough to cover medical expenses, to replace a car, repair a roof, help out a relative or just to meet costs other than the basics covered by guaranteed income, you can always sell bonds or shares in a bond fund to raise extra cash. But you can't sell off a piece of your Social Security benefit or dip into the hypothetical market value of your annuity whenever you like. Which means if you go ahead with your plan, you'll be relying exclusively on your all-stock portfolio to pay all your expenses beyond whatever your Social Security and annuity payments will cover. Of course, you can set aside a cash reserve to meet some of those needs. But to replenish that cash reserve you'll have to dip into your stock stash, so ultimately you'll be depending on your stock holdings to cover any needs that exceed your guaranteed payments. At the very least I think you need to ask yourself whether you'd be comfortable with this arrangement in times of market stress. Say we experience another bear market like the one in during the financial crisis when stock prices dropped more than 50% between early October 2007 and early March 2009. Would you remain cool and calm in the face of such a market meltdown because you know that your Social Security and immediate annuity remain intact even though the value of your stock portfolio has plummeted? Or would you get rattled and start selling stocks because, Social Security and annuity payments or no, you still find it too painful to watch tens of thousands of dollars in retirement savings evaporate as the stock market spirals downward? All of which is to say that how you divvy up your savings between stocks and bonds isn't just a matter of portfolio theory. You've also got to take the human element into account, specifically your emotional reaction if the market goes into a free fall or, for that matter, even seems on the verge of doing so. If you're truly able to look stoically beyond steep short-term setbacks and hang in until the market rebounds, then maybe you'll be fine with a very aggressive allocation to stocks. The same may be true if the value of your portfolio is so large -- or the amount you'll draw from it is so small -- that you're unlikely to run through your savings no matter how big a hit it may take during a market downturn. But if you know you might freak out when stock prices are nosediving -- or there's a good possibility that the combination of outsize investment losses plus withdrawals from your portfolio could deplete your nest egg to such a degree that it may never recover -- then basing your stocks-bonds allocation on the hypothetical value of Social Security might not be such a hot idea. You may be better off going with a more conservative stocks-bonds mix, one that will allow you to enjoy retirement without experiencing anxiety every time the market dives or seems ready to go into a prolonged slump. To help you decide how to divvy up the actual savings you have access to, I recommend you start by estimating how much investing risk you're comfortable taking. One way to do that is to complete a risk tolerance-asset allocation questionnaire. 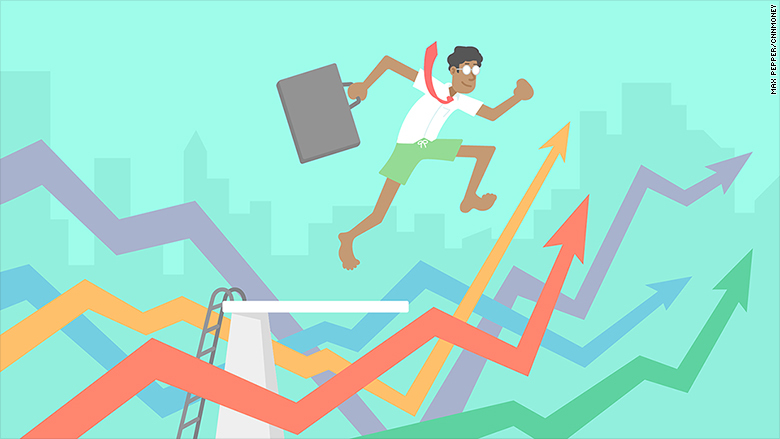 Even if you conclude you have a high-enough risk tolerance to invest all or nearly all of your actual savings in stocks, you should also consider whether it's worth taking on the volatility of an all-stock portfolio if you don't need to. If, as you say, your Social Security and annuity payments will take care of your essential living expenses, then it may not be necessary to invest your savings particularly aggressively to generate the additional income required to cover the rest of your expenses. As I explained in a previous column, as long as you keep withdrawals from savings reasonable -- say, an initial 3% to 4% a year subsequently adjusted for inflation -- a relatively modest stock stake of 40% to 60% of assets should be sufficient to provide the income you need without running too great a risk of running through your savings too soon. To see how long your savings stash might last given different levels of withdrawals and different mixes of stocks and bonds, you can check out this retirement income calculator. Clearly, you and your wife will have to decide what allocation of stocks and bonds works best for you for the actual savings you have at your disposal. Just make sure that whatever asset mix you eventually settle on is one that you'll be comfortable living with as you go about your daily life in retirement.